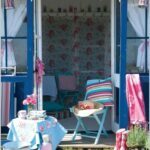 Beach Hut Interior and choice of decor – ever looked at a beach huts interior and loved it? Or have you looked at one and wondered why on earth the owner would decorate it that way? Marmite comes to mind, when I think about the wide range of styles that owners choose for their beach huts. 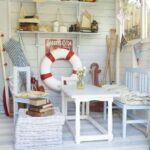 If you’ve recently bought a beach hut or just looking to update your decor, then I can imagine you’ve stumbled across this blog as you start to think about how to put your own stamp on it. Whilst keeping lots of functionality of course (such as being able to make a cup of tea!). Whilst formica tables and plastic chairs have been and gone (and may now be back in style?? ), there is now a wealth of inspiration at our fingertips online due to the increase in popularity of beach hut hire and the much loved ‘she-sheds’. Having recently renovated and decorated three new beach huts in 2016, I’ve picked some of my favourite pictures that have inspired my own beach hut decor which I hope will stir some ideas and creativity! p.s remember it doesn’t just apply to beach huts – you may find inspiration for a room at home or garden shed (aka she-shed!). My own study is very beachy! 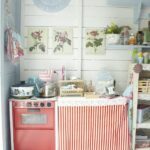 Lyme Beach Hut – Hen House Homemade Blog. This picture of a vintage kitchen larder is the inspiration behind our own which is now in my own beach hut Harley. 2. Charlotte Boyd – Stylist and Writer. Whilst I haven’t been brave enough to paint the interior of our huts, anything but white, I’ve been scouring high and low for oars for our walls since spotting this layout. I love the mix of rustic and green based colours. 3. Via Pinterest. The gorgeous glass doors, the mix of blues and pinks.. and that amazing curtain screen to change in. What’s not to like (p.s can I have those wellies please?). 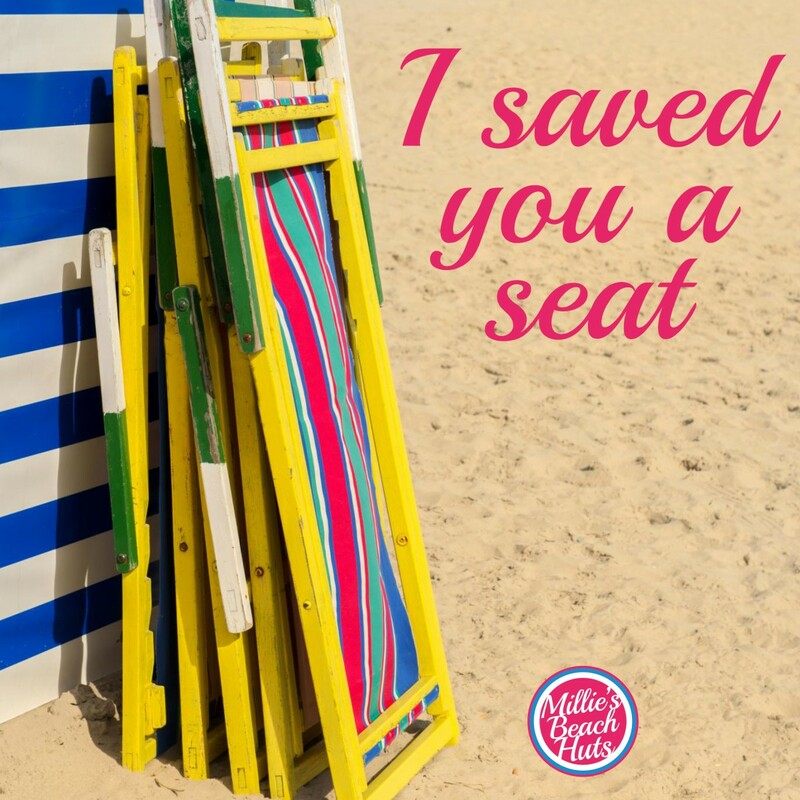 Folding chairs are a great addition to any beach hut – perfect for taking out onto the decking but not taking up a huge amount of space inside. 4. Inspirations Deco Blog – the stove and oven is a winner for me! A great layout and stripes really set this off – making the most of storage space is a must in a beach hut. A stove like this will need a gas bottle but well worth it for those winter months. 5. Via Pinterest – the clean pale lines, open shelves and wooden oars, creates a peaceful but functional space. Check out the very big life ring – I need to track down some of these! First of all have a think about what are you must have’s? Are you happy with a one burner gas stove for a kettle and saucepan/frying pan (for those morning bacon rolls)? Or are you looking to add a sink and a small gas stove? Are you happy with some table and chairs or are you trying to fit in a day bed for a snooze? Make a ‘must have list’ and then have a look online to see what other great ideas are there. Don’t limit yourself to searching for beach hut interiors, google garden building and ‘she sheds’ too. You may want to think about popping into your local garden centre and pick up their outdoor paint/garden building brochures. 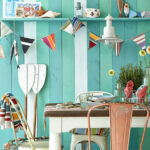 They will also help with inspiration for your beach hut interiors and layout. If you are struggling with storage solutions in particular or worried about space, take a look at boat layouts and storage. I’ve found the cleverest of ideas when searching on this theme due to their compact space and the need to fit luggage, food, drink, people and sailing kit on journeys! If you are a beach hut owner or looking to become one, then why not join our friendly UK Beach Hut Owners Facebook Group? 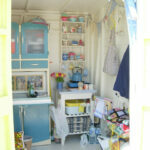 It’s a safe place to hangout and share your passion for beach huts whether you hire out or not. 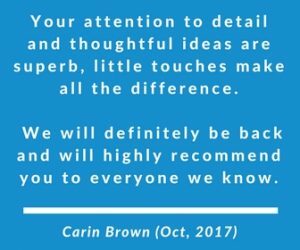 From paint recommendations, padlocks, beach hut associations and tradesmen to WordPress software for websites and advertising/social media, someone will be able to help or at least understand your passion. There is no such thing as a silly question in our group! Wow! Didn’t realise how distinctive beach hut interiors could be. I guess I’ve only seen them from the front. These look very impressive – and individual.